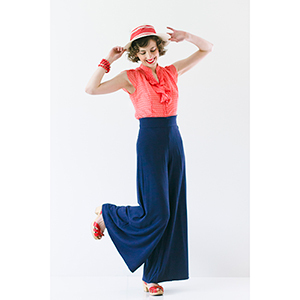 Linden Lady is a 1930’s inspired Palazzo Pant. View 1 has a faced waistband and lapped side zipper. View 2 has a high waistband with the lapped side zipper extending all the way up to the top of the high waistband. View 3 is a modified version of View 2, with bound buttonholes in the high waistband and the lapped side zipper extending up to the waistline. 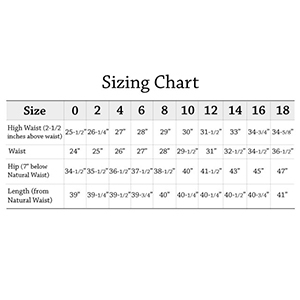 Suggested fabrics: View 1: Rayon Twill or Crepe; Light to Midweight Chambray; Linen; Stable Knits; Drapable Silks:Ponte de Roma; Cotton Jersey. View 2: Rayon Twill; Light to Midweight Chambray; Linen; Lightweight Denim:Ponte de Roma; Cotton Jersey. View 3: Wool Tweed; Rayon Twill; Linen; Light to Midweight Denim; Midweight Rayon Shirting; Ponte de Roma; Cotton Jersey.